This sounds great Jacqui – what a story! I’ve not read anything by this author – my knowledge of translated classic literature is woeful. I’ll definitely explore this writer further. It’s a terrific tale, strong on characterisation and storytelling. I’d never heard of this author until I stumbled upon this novel just by chance two or three years ago. It’s great to see it in the new Pocket Penguins range, but I’m not sure how much of her other work is available in English. Even so, it’s definitely worth reading. Seriously though, it’s a great book, very accessible for a 19th-century classic. I was expecting something much heavier, but it turned out to be a most engaging read. This sounds like good fun. And I’m going to have to stop reading your blog as I add another book to the TBR pile! Ha! It’s huge fun, Naomi. Kudos to Pardo Bazan for penning such a feisty tale. The characters are wonderful. A great read, especially if you’re in the mood for something with a touch of the gothic about it. Sounds excellent, Jacqui. I know barely anything about Spanish history and had not heard of the Glorious Revolution. One for the list, I think! Excellent. I hadn’t heard of the revolution either until this novel came along. It’s interesting how so much of our knowledge of European history seems to be focused on developments in the 20th century, particularly those connected with the two world wars. She’s good on the political/historically context of the day, this author. Hope you get a chance to read her at some point. This sounds excellent, with lots of drama. Not a novel I had ever considered reading. Great review. Thanks, Ali. It’s a great read, the sort of traditional storytelling we’ve come to expect from classic lit. It’s nice to see it in the Penguin Pocket Classics line-up – hopefully, it will encourage a few other readers to give it a whirl. This author was brave enough to capture the Galician society of her time, abuse of power exercised by the rich over the poor, very common in that area of ​​Spain. has the unmistakable seal of Bazan! You’re very welcome! 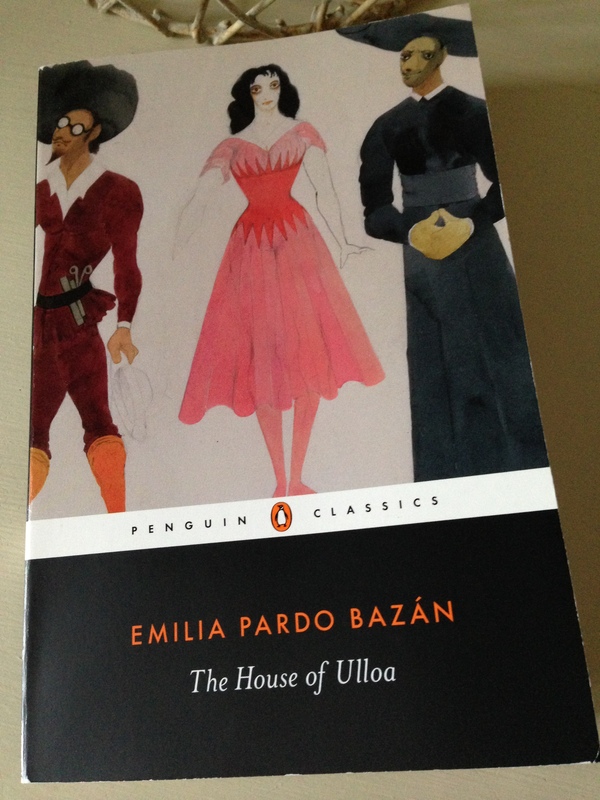 Yes, if this novel is anything to go by, then Pardo Bazan was just as feisty a person as her story suggests. It’s hard to imagine just how radical this novel must have been in its day, especially coming from a woman. As you say, she doesn’t shy away from giving an insight into the rather disreputable behaviour of some of the more powerful members of the Spanish society at that time. Which other Bazans have you read? I’m wondering if you read her in the original Spanish as there’s not very much available in English as far as I can tell. Oh, and many thanks for reblogging my post – very much appreciated! It sounds absolutely great. I’ll look out a copy. There’s a note about the Glorious Revolution in the novel’s intro as it forms an important backdrop to the story. Basically, a decade of revolts against the Spanish monarchy and government culminated in this revolution in 1868, during which time Queen Isabella II was abducted and a provisional government of the revolution installed in the country. The new government was made up of a ‘shaky and ill-fated’ coalition of Progressive and Unionist parties, plus support from the Democrats. Various developments followed, including the assassination of the new Prime Minister and much in-fighting between the coalition parties who were unable to form a stable government. Pardo Bazan taps into this context when she deals with the Marquis’ decision to stand in the local election. It’s quite an eye-opener into the political dynamics of the day, rather timeless in many respects. Actually, looking at the review again, Lezard also likens this novel to Waugh’s Scoop, which I read back in the days of my youth. The context is rather different here, but even so, I can see what he’s getting at with that comparison…an interesting thought. Glowing review, Jacqui, and it sounds great – I may well have to grab that new Penguin edition. Sometimes it takes a good review of a book we’ve had for ages to be the nudge we need to pick it up! Thanks, Karen. Yes, indeed. Those tweets from Grant turned out to be just the push I needed to pick it up. A great read for #Spanish Lit Month and for #WITMonth too. It;s nice to see it in the new Pocket Penguins range, quite an unusual choice in many respects. I think it would, not that I’ve read La Regenta myself, but I do recall seeing various pieces about it over the past couple of years. Which Pérez Galdós do you have in mind? I really enjoyed his novella Tristana, and would like to read more by him one day. Fortunata and Jacinta is his big one, I guess. Maybe not this year, but at some point in the future. By the way, I’m not sure if you know this, but Pedro Bazan had an affair with Galdos, so there’s quite a connection there. The cover’s great isn’t it? Turns out to be a pretty good fit for the characters in this story, even though it’s actually taken from a costume design for Don Quixote (courtesy of Edward Burro)! The Galdós I have on my shelf is Miau – rescued from a library where I used to work and which was closing – they were discarding ‘surplus’ texts. It’s a rather battered old Penguin Classics edition, but had to be saved from the skip. No, I didn’t know the two had an affair; how intriguing. Think I’ll steer clear of the big ones like F & J after the giant La Regenta. I”ve not managed any WIT titles this month so far, apart from a few Clarice Lispector stories – about 150 pp in now and can’t really say I’m enjoying most of them, so may not write about them. Am almost finished Zadie Smith, On Beauty, which I have enjoyed, mostly. Back to work soon, so won’t be able to read so much, or write posts so often…oh well. Oh, I’ll be interested to hear more about Miau – please report back. Funnily enough, I wasn’t mad about the Lispector I read last year – Near to the Wild Heart. Some of the writing was dazzling, but I couldn’t help feeling as though I was missing the point of it all. Oh well, maybe she’s just not for me. I have another of her novellas so will try again at some point. I hope you’ll write about On Beauty. Zadie Smith is one of handful of contemporary writers of real interest to me these days. I think I’ve read pretty much all of her fiction to date, On Beauty included. It sounds like a great find. Primitivo a more dsatardly Sir Humphrey, perhaps? I’m especially intrigued by the (at first glance rather contradictory) mixture of Gothic and naturalistic conventions (though come to think of it Hartley had a bit of that), as well as Pedro Bazan’s gender. When I think of naturalism, I think of male writers (Zola, Dreiser, Arnold Bennett, maybe even George Gissing). How interesting and refreshing to have a woman to add to this group. Maybe there are lots of other female naturalist writers, and I just don’t know them? I’m woefully ignorant of Spanish literature, that’s for sure… Thanks again for the review. It’s marvellous. I can’t tell you how much fun I had with with this one! A wonderful discovery. Yes, the mix of styles is very interesting. From what I can gather, Pardo Bazan was inspired by the naturalistic approach of some the French writers at the time (in particular Zola and the Goncourt brothers), so she set out to portray the world as she saw it. The novel’s introduction mentions her desire to explore the psychological and social factors behind her characters’ motivations, also her bravery in exposing the moral decadence at play in the spheres of politics and the nobility. (All of these themes are present in Ulloa.) Nevertheless, in spite of her naturalistic tendencies, there is more than a touch of the gothic about this novel, especially in the opening section where Julian approaches the infamous House of Ulloa for the first time. Quite a dynamic lady this Emilia Pardo Bazan! While we’re on the subject of Spanish leading ladies, have you come across Nada by Carmen Laforet? Another wonderful Spanish novel with a strong gothic feel to it, even more so than Ulloa I’d say. I read it couple of years ago and loved it to bits. My copy’s been sitting gathering dust too. Sounds fun, so one of these days…. Now all I have to do is find the time..
It’s well worth making time for. So glad I finally got around to reading it. This has been a ‘maybe’ book for me for a long time – thank you for turning it into a ‘definitely’! Funnily enough, I thought about you as I was writing about this novel. There’s every chance you’ll take to it, especially given the rather gothic atmosphere. It’s easy to forget how much of a stir this must have caused at the time of its publication. Quite a story all in all. An easy book to recommend, isn’t it? Basically a comedy of manners, but with all of these other enjoyable moods or touches. I don’t know of any other Spanish women writers from the period – I barely know of more men – but there were a number of contemporaries in Italy working some similar Frenchified aesthetic ground who are worth seeking out: Matilde Serao in Naples, Grazia Deledda in Sardinia, Maria Messina in Sicily. It is! What an absolute delight. I recall Richard saying that this book has been a hit with everyone. Well, all those readers who were tempted to pick it up in the first place. Perez Galdos is the only other Spanish writer I’ve read from this period, an interesting connection given his relationship with Pardo Bazan. Many thanks for the tips on those Italian writers. A couple of the names are vaguely familiar (Serao and Messina), so I’m wondering if you and/or Scott have written about them at some point. In any case, I’ll look them up. Cheers, Tom. Brilliant review Jacqui. It sounds like a novel packed with character and intrigue. For some reason I’ve not read much in the way of Spanish literature, though I learn a lot about it from your blog! Thanks, Belinda, Yes, plenty of drama in this one – it was a joy to read. You seem to read books with the most interesting sounding characters and situations. I am thinking that there are few books published these days with positive depictions of clergy. That seems to be very distinctive. It’s been a while since I read anything from the 19th century, but this novel reminded me just how enjoyable the classic texts can be. The characters are terrific here, as are the scenarios Pardo Bazan subjects them to. I genuinely think you would like this one Brian, especially given your interest in literature from this period. That’s a valid point about the depictions of clergymen in literature these days. Barbara Pym springs to mind as someone who portrays these figures in a positive, sympathetic light, but she was writing her novels in the 1950s. I suspect the mood has changed somewhat since various scandals involving the church have come to light. Last year my book group read a novel by John Boyne — A History of Loneliness — about child abuse in the Catholic Church. Not my usual choice of reading material, but thought-provoking nonetheless. Wonderful review. I’ve never heard of it and it makes a good choice for next year’s Spanish Lit Month. It goes on the virtual TBR. Great! It’s perfect for Spanish Lit Month. Well, by rights I should have posted this piece back in July, but luckily Richard granted us an extension to allow for late reviews. I’d never heard of this novel (or Pardo Bazan) until I read a review in The Guardian a few years ago. That was my trigger for buying it in the first place. So glad I picked it up. I’d love to know what you make of it, especially given her influences – she was inspired by some of the French writers of the time, Zola and the Goncourt brothers in particular. It feels quite theatrical in places, so I could imagine it working as a play (with a little adaptation, of course). Great review. I think I would enjoy this read. Funny enough I had bought a copy few months back in the new Penguin color versions with the yellow cover. It arrived damaged and I had to return it. Maybe I should order again. It sounds like good writing plus a good story. Thanks. Yes, do order another copy. It’s great to see it as part of the Pocket Penguin series, quite an interesting choice in some respects as it’s not terribly well known. Hopefully the new edition will introduce to a wider audience. Wow, that sounds like such a delicious romp of a read. I’m not sure I’ve read anything quite like it, although your response reminds me of how I felt after reading Ann Radclyffe for the first time, having thought of her as a “classic” writer and then being surprised to find that it was actually fun, and as you’ve said about this one, juicy in fact! Thanks for adding another to my TBR! Ooops, not Radclyffe but Mary Elizabeth Braddon. Perhaps the same is true of Radclyffe, but I haven’t read her yet! Even though you haven’t read her, it’s interesting you shoud mention Ann Radcliffe – not a bad shout at all in this context of this book! I’ve only read A Sicilian Romance, but there is definitely a touch of the gothic about the world Prado Bazan is portraying here. (Mary Elizabeth Brandon I’ve yet to read, so I can’t speak to any similarities in style as far as she goes…but I see where you’re coming from in terms of the fun element.) A delicious romp of a read is pretty good way of describing it too! She is rather feisty this Emilia Pardo Bazan – I do hope you get a chance to read her one day. I haven’t heard it, but I will most definitely look it up. Thank you for the recommendation! Thanks for the link. I really enjoyed this – it has a little of everything. Julian was a little precious but Primitivo is a great character. Very welcome, Grant. Yes, Primitivo was a wonderful creation, while Julian’s deeply pious nature simply added to the humour. Thanks for the nudge to pull this from the shelves – I definitely owe you one. Oh this does sound good! I like it when a book has a lot happen in one place, unravelling all the personal aspects of a household that would usually be private. It’s brilliant. Yes, so do I – that’s a great way of visualising it. I could imagine it working as a play, one of those farces where various things happen behind the other characters’ backs. It’s a shame that much of her work doesn’t appear to be readily available in translation, otherwise I’d be up for reading another. Yes! Definitely. Now I want it to be a play as well. I feel the same way about Magda Szabo, there is so much and so little I can read. I’ve yet to read Szabo although I do keep seeing her name across the blogosphere. The Door has been getting quite a lot of coverage as part of WIT Month, possibly boosted by the release of the NYRB edition last year. I’ll have to try her at some point! When I saw you rate this on GR, I added it to my list, but haven’t gotten around to reading your review until now. Starting to try and catch up a bit after a busy summer! Oh, excellent! It’s a wonderful romp of a novel. As Grant said in his comment above, it has a little bit of everything. I’m still feeling my way around Good Reads, but it’s a useful way of seeing what everyone’s been reading – glad to hear you spotted it there. .
I’ll have to come back to all the earlier comments later, but suffice it to say that you make me wish that I too had read this entertainment sure thing for Spanish Lit Month (as did Grant’s and Tom’s reviews previously). Just what the hell’s wrong with me?!? Rhetorical questions aside, what a great decade the 1880s were on the Iberian Peninsula: Clarín, Eça de Queiróz, Galdós, Pardo Bazán. That lineup could dominate a Spanish Lit Month all by itself. Nada is one of my favourite novels. So good! I loved the mood in that book, such an evocative atmosphere.